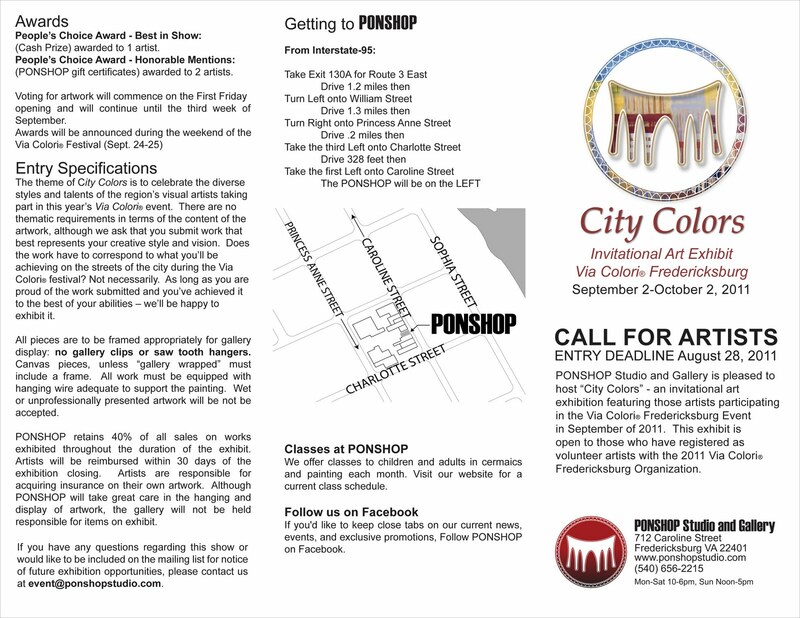 PONSHOP Studio and Gallery is pleased to host “City Colors” an invitational art exhibition featuring artists participating in the 2011 Via Colori Fredericksburg Event in September of 2011. 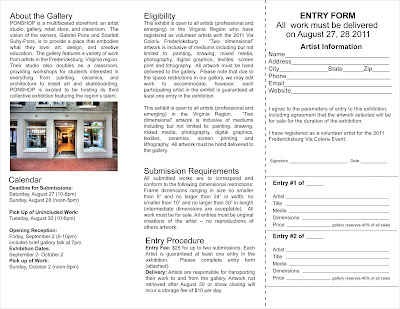 This exhibit is open to those who have registered as volunteer artists with the 2011 Via Colori Fredericksburg Organization. To register as a volunteer artist with Via Colori, Click Here. This exhibit is open to all artists (professional and emerging) in the Virginia Region who have registered as volunteer artists with the 2011 Via Colori Fredericksburg. “Two dimensional” artwork is inclusive of mediums including but not limited to: painting, drawing, mixed media, photography, digital graphics, textiles, screen print and lithography. All artwork must be hand delivered to the gallery. Please note that due to the space restrictions in our gallery, we may edit work to accommodate, however, each participating artist in the exhibit is guaranteed at least one entry in the exhibition. All submitted works are to correspond and conform to the following dimensional restrictions: Frame dimensions ranging in size no smaller than 8” and no larger than 24” in width, no smaller than 10” and no larger than 30” in length (intermediate dimensions are acceptable). All work must be for sale. All entries must be original creations of the artist – no reproductions of others artwork. The theme of “City Colors” is to celebrate the diverse styles and talents of the region’s visual artists taking part in this year’s Via Colori event. There are no thematic requirements in terms of the content of the artwork, although we ask that you submit work that best represents your creative style and vision. Does the work have to correspond to what you’ll be achieving on the streets of the city during the Via Colori festival? Not necessarily. As long as you are proud of the work submitted and you’ve achieved it to the best of your abilities – we’ll be happy to exhibit it. 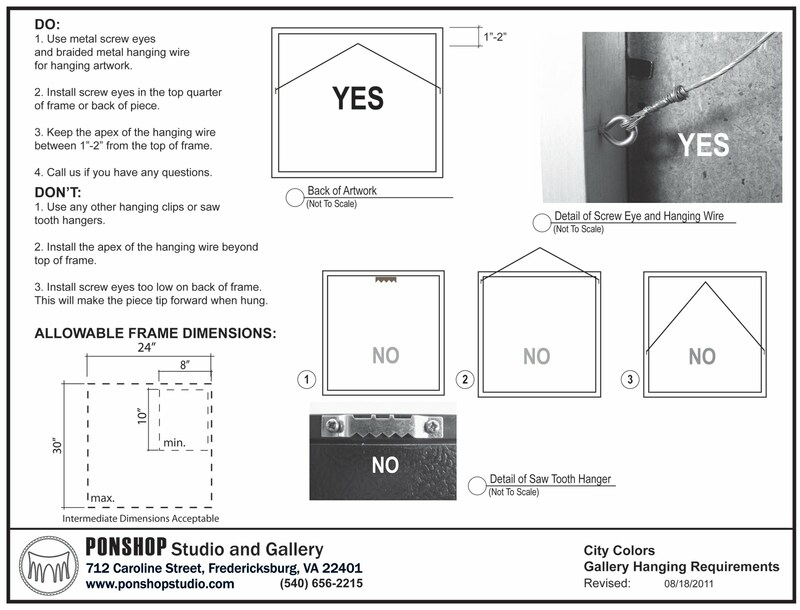 All pieces are to be framed appropriately for gallery display: no gallery clips or saw tooth hangers (see attachment). Canvas pieces, unless “gallery wrapped” must include a frame. All work must be equipped with hanging wire adequate to support the painting. 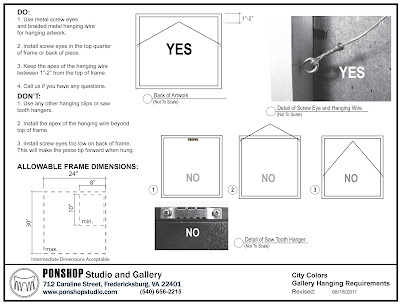 Textiles intended for wall hanging must include hanging system. Wet or unprofessionally presented artwork will not be accepted. Entry fee: $25 for up to two submissions. Please complete entry form (above) and deliver with artwork. Deadline for Submissions: Saturday, August 27 (10-6pm) Sunday, August 28 (noon-5pm). Opening Reception: Friday, September 2 (6-10pm) includes brief gallery talk at 7pm. Voting for artwork will commence on the First Friday opening and will continue until the third week of September. 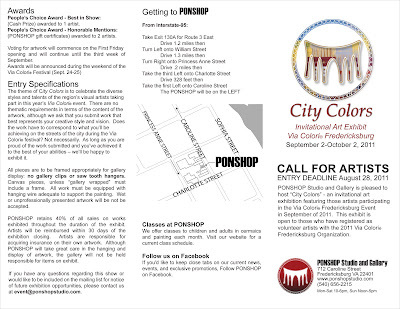 PONSHOP is a multifaceted storefront: an artist studio, gallery, retail store, and classroom. The vision of the owners, Scarlett and Gabriel Pons, is to provide a place that embodies what they love: art, design, and creative education. The gallery features a variety of work from artists in the Virginia region. Their studio also doubles as a classroom, providing workshops for students interested in everything from painting, ceramics, and architecture to street art and skateboarding. If you have any questions regarding this show or would like to be included on the mailing list for notice of future exhibition opportunities, please contact us at event[at]ponshopstudio.com.